Caleb's parents came to visit us last month to spend time with Madeleine. Right before they left, they bought a bunch of fresh peaches and left some of them with us. As the peaches were ripening on our counter, I brainstormed what I should bake with them. I hadn't baked anything since Madeleine was born, and I was missing it. 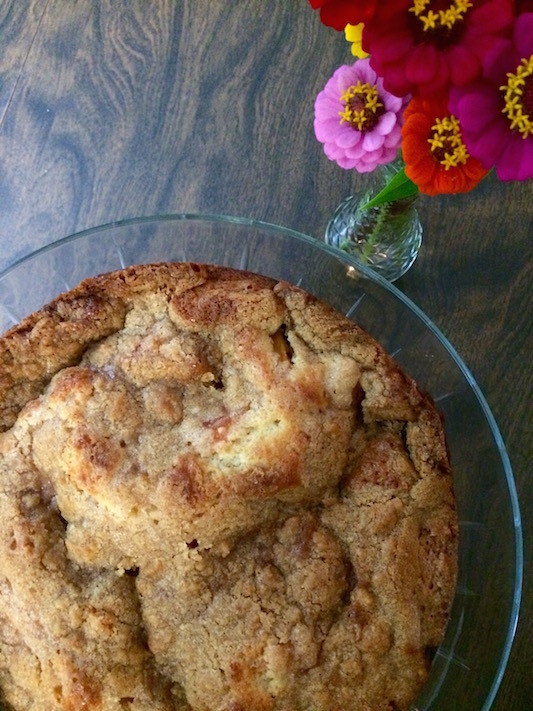 I finally settled on a new coffee cake recipe with peaches and streusel as the topping. The cake was moist, the peaches were perfectly ripe, and the streusel topping was the perfect finish. To prepare streusel topping, beat butter in a medium bowl with an electric mixer at medium speed until smooth and creamy. Gradually add sugar and brown sugar, beating well. Add flour and cinnamon; beat just until blended. Chill. To prepare cake, beat butter in a large bowl with an electric mixer at medium speed until smooth and creamy. Gradually add sugar, beating well. Add eggs, one at a time, beating only until the yellow yolk disappears after each addition. Whisk together flour, baking powder, and salt in a large bowl; add to butter mixture in thirds, alternating with half of milk, beginning and ending with flour mixture, beating at low speed just until blended after each addition. Stir in vanilla. Pour batter into prepared tin. Top with sliced peaches. Drop 1-inch pieces of streusel topping over fruit. Bake at 350 for 1 hour 10 minutes to 1 hour 20 minutes, or until center of cake is set (a wooden pick inserted in center will be covered in moist crumbs, but not wet batter). Cool completely on a wire rack, about 1 1/2 hours. Makes 8 servings. Oh, this looks and sounds so yummy! I can't believe peach season is going to be over soon! I might have to whip one of these up before we leave on Friday...Also, that cookbook continues to be our favorite! I made the jambalaya recipe out of it last night (omitted the shrimp and chicken) and it was a winner. Just, fyi for you. Glad you're back into baking. Sometimes it's just doing normal things like that after having a baby that make life seem to get back into balance. You're doing a great job as a Mommy!